THOMPSONVILLE, MI — I was drifting with the current when I saw them ahead: two 4-foot-tall sandhill cranes. Each was stalking the shaded shallows, methodically looking for something to eat. I signaled my buddy, who put up his paddle and began to drift quietly, too. We were mesmerized by the birds, their crimson crests a bright contrast to the lush green foliage lining the river banks. I suppose we shouldn’t have been surprised to see them. 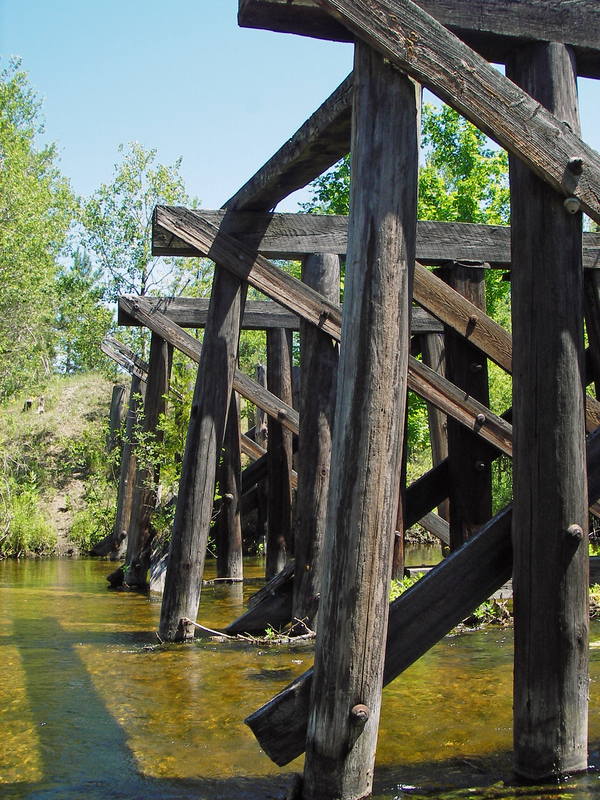 The upper stretch of the Betsie River is known for its wildlife. We had launched from Grass Lake State Forest Campground just downstream from the Grass Lake State Wildlife Flooding. That area is known for its waterfowl and birds. But the cranes are always special to see. And they would be just the start of a day full of deer along the banks, trilling red-winged black birds, kingfisher antics and scores of luminous, emerald damselflies. 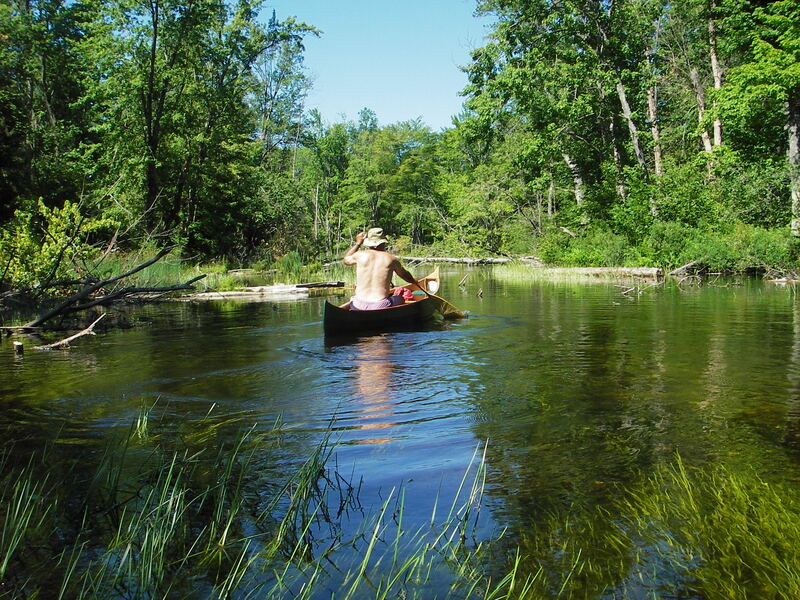 The Betsie is one of Michigan’s better-known Wild and Scenic Rivers. It was designated in 1973 under the state’s Natural Rivers Act, an auspicious piece of legislation that put a zoning framework in place to protect the natural beauty of special streams such as the Fox and Two-Hearted rivers in the Upper Peninsula and the AuSable, Jordan, Rifle and Boardman rivers, to name a few in the Lower Peninsula. While many anglers know the Betsie for its downstream salmon and steelhead runs, the upper and middle 30 miles or so are a gem for the paddler and nature lover. The river cuts through state and private lands, where the scenery is gorgeous, where on this first of two days, we would hardly see a soul, though we’d spend half a day running the first 10 miles. Magee is right about the river being twisty and narrow, particularly after the first couple of miles. He also hit the mark on its challenges. Tight hairpin turns calls for boat control. Precise maneuvers are sometimes called for when logs cross the river. The Betsie starts out placid, but it begins to pick up speed an hour out. The river drops 250 feet between the outlet at Grass Lake and Betsie Lake 48 miles downstream. But some its sections are considerably steeper, dropping 8 to 14 feet per mile, according to estimates by Michigan Department of Natural Resources staffers. That spritely current can make for a fun and exciting ride, rather than the more relaxed 3- to 5-feet-per-mile gradient it averages. “We get a lot of people who come to party on the river, but we also get as many who are the more natural-type people. What they come for is the wilderness views, the river itself and the challenge,” Magee said. Beginners are likely to have difficulty on the river at high water, but not during the summer months, when water levels drop and current speed slows. In fact, they may find themselves occasionally needing to get out and drag a canoe over shallow, gravel flats, a good excuse to get wet on a hot summer day. Magee “grooms” the river regularly to keep the route open for paddlers when new trees fall. He also will help spot a car or shuttle paddlers who have their own boats. You can find out more by checking his website. One pass through, and you quickly become a believer. The first day of our trip took us 10.5 miles from Grass Lake to the Gallegar Street take-out just downstream from the site of the former Thompsonville Dam, which failed in 1989 and subsequently was removed. A nice set of standing waves marks the spot today. It proved a day of delightful paddling with lots of maneuvering and more than a few bottom scrapings. The water levels are very low. And though we cut our planned route short the second day, we still enjoyed a several-mile run from Thompsonville to Kurick Road, a wider and deeper stretch of river with more homes, that is even prettier than the upper segment. More than one paddler we spoke with that day said their favorite stretches were still ahead. That gave us plenty of reason to return when water levels are a little higher. This entry was posted in Uncategorized and tagged Betsie River, Canoeing, DNR, Natural Rivers Act, Paddling, Wild & Scenic Rivers. Bookmark the permalink.